Have you ever tried to sit outside in the dead of winter, watch the sunset, drink wine and eat delicious appetizers on an outdoor deck? If you’re Canadian, you probably have tried, and been successful after donning your long undies, snowmobile suit, balaclava, heated snow-boots, thermal gloves and of course your jaunty winter tuke! You probably arrive at the sunset location of choice via a snow machine, complete with heated seats and heated handles and perch yourself on the rocks beside one of our many frozen lakes, or on the deck of your winterized cottage. Some of you may even ice-fish through the long cold winters, there’s nothing like fresh sushi in the middle of a frozen lake. Most of us though, pass the winters dashing between heated garages, navigating underground tunnels to the office, or scurrying through the heated sky-walks from meeting to meeting. We all have car starters here and we plug our cars into the outdoor garages and parking spaces so that our cars won’t be dead hunks of going nowhere metal at the end of a busy day. The snow-banks are as high as we are, and even in the worst of snowstorms, we make it to work – and on time! 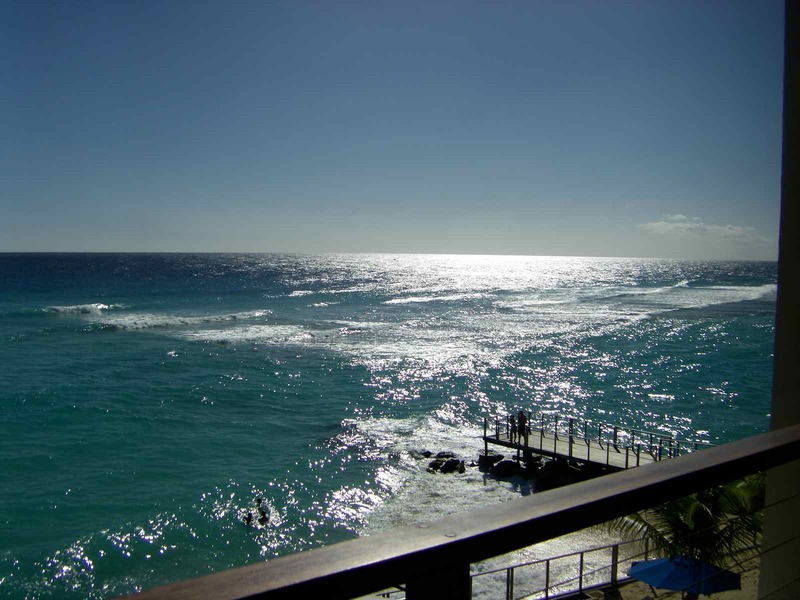 Sunset in Barbados in February at the St Lawrence Beach Condos jr penthouse. It’s outrageous to think then, that just two weeks ago today, I was sitting along with my family on a gorgeous wrap-around deck facing the Caribbean Sea, drinking wine and eating delicious appetizers in only a swimsuit. The only thing to worry about was where to eat dinner that night, and whether or not to go for another swim in that beautiful azure blue sea. For those of you out there reading this, and considering a stay in Barbados, don’t hesitate to book now! We stayed at the St Lawrence Beach Condos on the south coast in the St Lawrence Gap (other accommodation options, here). 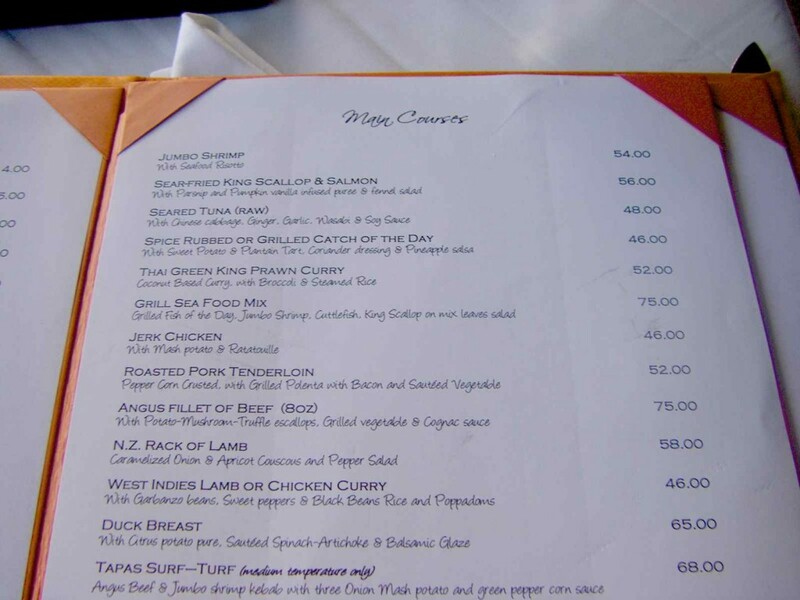 We had our choice of dining at one of the numerous restaurants within walking distance such as Josef’s, Pisces and Harlequin, the new Waterside (where South Seas used to be), and many others. For more casual options, we ate the fantastic street vendor food: wonderful cheeseburgers, bbq chicken and macaroni pie. Delicious! Other nights we bought still-wiggling-fresh fish at the local fish market (Oistins) and dined in. And if you want a very special treat, jump in a cab – cabs are plenty and very easy to secure in “the Gap” – and take a ride to Tapas, situated on the south coast boardwalk. We took Jane’s recommendation and got to the boardwalk around 5:30 to watch the magnificent sunset, and had pre-booked a seaside table. The menu is extremely varied and mouth-wateringly delicious! 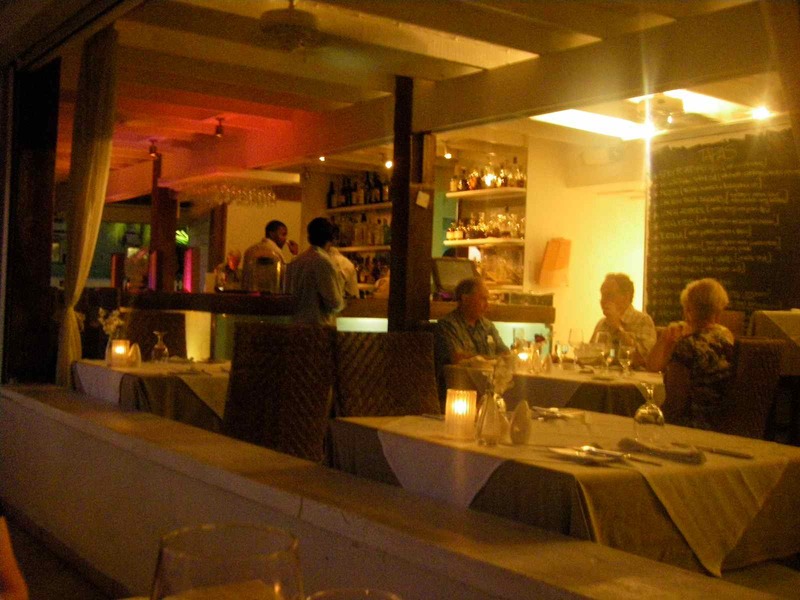 Tapas Restaurant, Barbados south coast. Tapas' menu (halve these prices to get the US equivalent). It is difficult to make a choice, which means you do need to go back more than once. It is also a lovely lunch location, and if your plane leaves later in the day, it is a good way to wrap up your trip. If you are a red wine drinker, try Chocolate Block from South Africa, and the tapas and main courses were absolutely scrumptious. The seared tuna in particular is one of my all time favorites. The setting is gorgeous, and all of the tables are draped with white linen, and fresh orchids. Service was excellent and we wish Tapas were here in our city, mind you the view would not live up to the expectation that has now been set. Well, according to my ipod it is a balmy -12C in Winnipeg, Manitoba, and a beautiful 27C in Barbados. Given that it is 5:30 pm in Barbados, right about now I would be sitting facing the setting sun, with a glass of red wine and some crackers and cheese. And I wouldn’t be wearing a ski suit or donning my six layers of clothing in order to do so. This little poem was written in Barbados as I sat facing the sea not wanting to ever leave, and it sums it all up nicely. when it relaxes into the surf. when we are back here. Debbie Grant is a poet and principal at Grant Design Group in Manitoba, Canada. She and her husband Dave are returning to Barbados this Christmas. 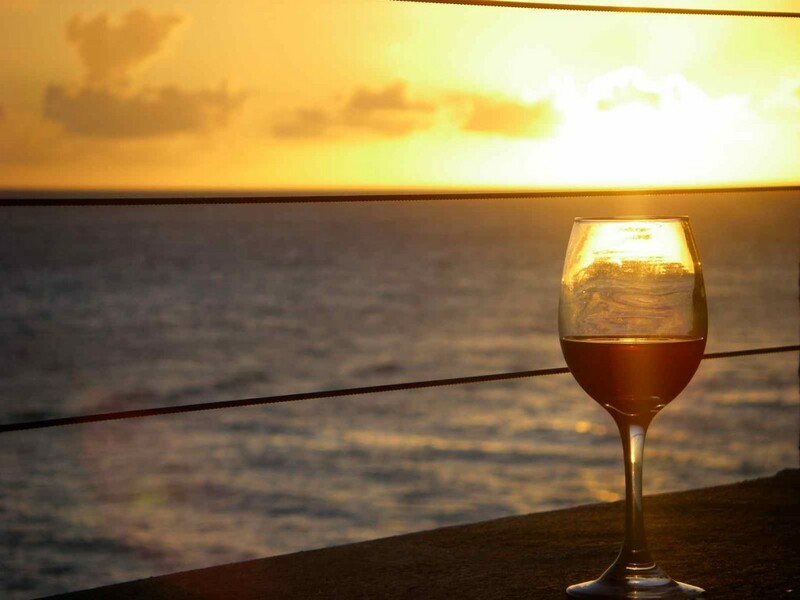 Our warm sunsets await. This is a wonderful post, Debbie! Made me wish I was there (oh wait, I am). Fabulous! Come on back! Hi Debbie, what a wonderful post. I can relate to the cold weather – although in the Washington, DC area it is nowhere near what you encounter in Winnipeg. Glad you enjoyed your stay at St. Lawrence Beach Condos — they are gorgeous. We toured it last year and this fall we will stay there ourselves. It’s a perfect location – right where all the action is and easy to get to lots of great restaurants as well. Love your photos. Your meal at Tapas sounded fantastic as well. Cannot wait to return this fall. Every word of this is true, and it’s so true that we can’t wait to spend Christmas in Barbados! Glad you enjoyed, I just had to share! This just showed up on my Facebook page and makes me so want to return to Barbados where I lived for two years.Your poem is so very light and breezy I could feel the sun on my skin and the warmth of the sea.Beautiful Barbados maybe one day !! !Ill return.